The last few months have been eventful in the life of Grace to say the least! Joy has abounded as we've watched new members come into our covenant family, mission trips begin, end, and begin again. Our Summer of Spreading Christ is now officially underway. New God-centered relationships are emerging daily within our fellowship. The Lord is at work for His glory! Summer of Spreading Christ: The new dates for each of the summer outreach events, and assignments for various roles, will be given out at this Sunday's lunch fellowship (June 24). Come with an empty belly to be filled by good food, and willing heart to be used by the Lord! Foundations of Grace: Friday evening, Saturday morning, July 13-14. If you've been attending Grace from our very beginning, or have just joined us recently, Foundations is for you...especially if you are considering covenant membership. Foundations unfolds the vision, values, and distinctives of Grace. Or, put simply, it is a short seminar led by our pastors that explains our church's foundation. This seminar is a great opportunity for you to get to know what makes Grace tick, and provides you with a free environment to ask questions about the church. Enjoying Jesus in the Book of Revelation: Friday evening, Saturday morning, July 20-21. Mike Rusten (click, then scroll down to read about Mike), an elder at Bethlehem Baptist Church in Minneapolis, will be leading an in-depth seminar walking us through the book of Revelation. Having done his PhD work in Revelation, and having led numerous seminars through Revelation, Mike is well-equipped to lead this seminar, and has an inviting leadership style that draws his listeners in. Registration is now open (Cost approx. $15/family for the listening guide notebook. See the resource table at GC to sign up). SE Asia & Bangladesh: Be intentional about remembering Aaron and Kevin in prayer over the next several weeks as they seek to spread lasting joy in Jesus in Southeast Asia and Bangladesh. One way to prepare your soul for maximum delight in God this coming Sunday as we worship Christ together through the preached word can be done by prayerfully reading Genesis 12-22. The Genesis text contains the redemptive background from which the Apostle Paul builds the better part of his argument in this week's sermon text (Galatians 3:1-14). Wanting to lay hold, with you, of every blessing that is ours in Christ! Yes, God is at work for His glory in Ethiopia through the gospel of Jesus Christ. Even though the spiritual landscape is, in many areas, in need of greater health, what part of the world isn't? The encouraging sign in Ethiopia is that the Lord is raising up men with a desire for church health to be measured by the standard of God's Word. Because nearly 80 men have committed themselves to two years' worth of theological training with the express purpose of planting new churches among the unreached of Ethiopia, the evidences of God's work for His glory there are apparent. 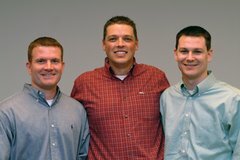 Thank you all for continuing to pray for these men, as well as for Anthony and Amber Mathenia as they seek to point them in a God-honoring direction. Now, I would like to call to your attention four brothers--two from PTI, and two from the Addis Kadan Bible College--that you might join us in praying specifically for them. Even though our time with each of them was short, all four demonstrated significant promise in the areas of pastoral gifting and spiritual leadership. Perhaps you will have the honor of shouldering up next to them for a millennium or two in the great sea of worshipers! The first is Abraham (pronounced, Ahh-bra-ham). This brother arrived in Addis Ababa nearly eight years ago from his village which is approximately eight hours north of the capital city. Being alone in the capital city was no small challenge, but proved to be the greatest blessing in his life. Soon after arriving in Addis, he was able to being living with his aunt who is Orthodox (ie, anti-Christian). Not long after moving to Addis, Abraham heard the gospel and came to saving faith in Jesus Christ. Just over one year later his aunt disowned him because of his faith, and required him to move out. For the last several years, he has been working as a guard at the Addis Kadan (yup!) offices, and has been devouring the Word of God. During these recent years, the Lord has placed a burden on Abraham's heart to reach his people (Tigray/Tigrinya) with the gospel. Pray that Abraham will be equipped by the Holy Spirit to carry the gospel to his people and that many would believe! The second is Abu (standing, praying). Like Abraham, Abu is also part of PTI. Unofficially, the PTI brothers seemed to look to Abu for leadership. During the break times, and even during a few of the Q & A sessions, I noticed that the guys were looking to Abu for direction and articulation. His face lights up with the light of Christ. I do not remember the name of his village, but I do remember he lives about 250 kilometers from Addis, and his first language is Oromo/Oromiffa. His grasp, like Abraham's, of the things we taught was obvious. Please pray for Abu, and for the church(s) that the Lord will use him to plant. May many come to Jesus through his ministry. The third is Misfin (pictured sitting, front row, second from left). 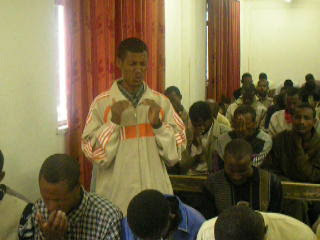 Misfin is one of the Bible College students. He, and his eight classmates, are scheduled to graduate in mid-June from their three-year training program. Each of the eight were selected by the denomination to be leaders in/over the eight regions of Ethiopia into which the denomination has divided th e territory of Ethiopia. This brother, like the rest, is humble and demonstrates a solid grasp of biblical truth. During a three hour session on ecclesiology, Misfin expressed many encouraging evidences of his desire to see the Addis Kadan embrace the biblical model for church life and organization. He currently works with the youth at a church in Addis, and is interested in further study if the Lord permits. Misfin is married and has two children. Finally, I would like to invite you to pray for Getanet, another student at the Bible College (pictured making "wat"). A bit tongue-in-cheek, but not far from the truth, Getanet might be the only Ethiopian pastor in the entire country. The common practice among evangelical churches, especially Addis Kadan churches, is to forgo the role of pastor for an "evangelist" who travels away from the church, but from time-to-time preaches at his (or her) church. Instead of a pastoral ministry from an individual or a team that is somewhat consistent, much less expository, the churches usually have a different speaker each week. Of course, this practice prohibits the health of the church. Getanet, on the other hand, preaches to his congregation about 40 Sundays per year. This is almost unheard of in his culture. More than that, he is deeply concerned for the spiritual health of every one of the members of his church. May Getanet serve as a model that other Ethiopian pastors will follow. Of this I'm sure, God is at work for His glory in Ethiopia through the gospel of Jesus Christ. By now many of you are aware of why Nathan and I went to Ethiopia, but for the sake of those who are just now joining us, allow for a brief review. The Lord has given abundant favor to Anthony and Amber Mathenia in the eyes of many of the Ethiopian believers. So much so that a denomination (Addis Kadan) has essentially handed over to Anthony the responsibility to train its next generation of pastors. This is where the Pastor's Training Institute (PTI) was born. Approximately 80 PTI students from all over Ethiopia (literally) who have been identified by their churches have enrolled in a two-year theological training program with the desire to be equipped to plant churches among Ethiopians who have yet to be reached with the gospel. The students live "out country" and have/will travel into Addis Ababa for two-week intensive training sessions during the next two years. After the two years of study, the students will be evaluated by the Bible's standards for elders, and upon evidence of qualification, will be sent out two-by-two to plant new churches "out country." It was for one of these two-week intensive teaching sessions that Nathan and I went to Ethiopia. This was only the second session of PTI, the first being only one month prior (and led by our friends Kurt Strassner and Scott Duley). Kurt taught Christian Ethics from the Sermon on the Mount, and Scott taught the Doctrine of God. During our trip, Nathan taught the Doctrine of Christ, and I taught Christ-centered Theology of the Bible. The students are hungry, and by-in-large, soaking up the teaching. There are obvious barriers for some of them though. For example, the translation of the teaching is in Amharic, which for some of the students, is their second or third language! Could you imagine taking theology courses in Spanish based on what you learned in High School? Of course, theology has a vocabulary all its own, and adds to the interesting translation dynamics. Nonetheless, the students demonstrate an eagerness to learn, and are full of questions. Daily, for two weeks, they sit shoulder-to-shoulder on hard benches for no less than six hours thinking, taking notes, and engaging with the most important things under heaven. Please pray for them regularly! The misconceptions of biblical truth, and especially how the truth of the bible impacts local church gatherings, is wide-spread. Neither Anthony, nor any of the guys who have taught at PTI, have a desire to "westernize" the ethos of the church in Ethiopia. It is good and right for redeemed sinners to express worship to King Jesus in keeping with their own particular cultural expressiveness...unless, of course, the culture contradicts the Biblical pattern. Everyone on God's green earth is influenced by the culture in which they live. It is part of our relational DNA. We operate, talk, dress, express, and relate in a way that has been ingrained in us from our first breath. Sometimes, though, our cultural expressiveness contradicts biblical practice. This is true for Americans, just as much for Ethiopians. We have "convictions" that church should happen a certain way with certain "non-negotiable" elements (like bulletins, pews, nice clothes, microphones, 30 minute [or less] sermons, invitations, etc.). Well, you get the point. Ethiopians also have "convictions" about "the way we've always done it." For them, charismatic chaos, proof-texting, isegesis, emotional frenzy, and music-dominated services are what church is (Oh, wait, I was supposed to be describing them, not us). Again, I think you get the point. Because of misconceptions about biblical truth (and we all have them) it is vitally important that the next generation of pastors in Ethiopia have a solid dose of biblical truth. And, what's most encouraging, is that they want it! PTI doesn't concern itself with "what we do in American churches," but rather, "what does the Bible say." Nathan walked the brothers through the gospel of John and in chapter three gave as a clear an explanation of the Spirit's role in regeneration (which, in the text preceeds faith and repentance, but guarantees them both) as I've heard. This, you see, has nothing to do with "the way we do church in the US." So, as you pray for these brothers, pray that they will be given Holy Spirit discernment to know how to apply the truth they learn in a way that is faithful to the teaching of Scripture...even if it wars against the cultural norm. And, as you do so, pray the same thing for Grace Church! Many thanks to Kevin W. who pointed out two wonderful seminars happening tomorrow morning at the PCA meeting that I had overlooked. I hope to make it to both of them! For any GCers planning to attend the keynote session tomorrow evening with RC Sproul, let's plan to connect in the back left corner of the room (where the session will be held) at 7:10p and find a place sit together. Information here. (Seminar info here). Praying for you as I type! Right now I am at a youth camp in West Virginia preparing to speak to a group of students on the theme of 'Seeking the Face of God'. Oddly enough, as remote as this place is, there happens to be wireless internet at the welcome center. As I type I'm praying these things for each of you at GC as you are in the middle of service right now! That the Lord would be pleased to give you aide in worshiping Him this morning. May Christ be your treasure even now! That the Lord would be pleased to give you aide in corporate prayer. That the Lord would be pleased to help Jordan as he faithfully preaches the surpassing riches of Christ in Galatians 2. That the Lord would be pleased to help those attending GC to worship with Jordan as he preaches. That the Lord would be pleased! I love you and genuinely miss you. Many of your faces have scrolled through my mind and prayers over the past several weeks of being away, but I long to see you face to face. Wedding Charges To Pray For Me! I was honored to perform the wedding ceremony this morning for BJ and Ashley Eason, both of whom were formerly students in my youth group. As if my four children haven't already made me realize I'm getting old! Here are several of the biblical charges I gave to them. Would you please take a moment to pray that these realities would be true in my own marriage (and yours)! Nathan and I arrived at safely at 4:30p last evening. Once again, thank you all for praying for us! There are so many things to share about the evident successes of this trip. Lord willing, in the coming days we will find the opportunity to do so here on SC. GC, I'm looking forward to seeing you all on Sunday. Galatians 2:11-21...Oh my! Continue praying for Nathan who will be leaving again this Friday evening in order to speak for one week at a college/youth camp for a church in OH. I think its day 10?? At any rate, it is Sunday morning in Addis Ababa. Nathan and I will each be leaving shortly in order to preach at different churches in the city. Nathan will be expositorily exulting in Romans 3:21-26, and I will be doing the same in Matthew 7:21-23. We are praying for Jesus to be exalted here, and in the service at Grace. May the hearts of everyone at these services be preoccupied with the God of the Bible, through the work of His Son, in the power of His Spirit! The PTI program concluded yesterday morning. We are convinced that the Lord cares much for His glory in Ethiopia. The supernatural way that Nathan and I felt carried during our teaching responsibilities was another convincing evidence of the Lord's care for these future pastors. Thank you again for praying for us. Please continue praying for these future pastors too. Nathan led a bible study in Anthony and Amber's home last evening. Wonderful and worshipful exposition of God's love in the gospel of His Son! The degree to which we miss our families, and our church family, is impossible to describe. We look forward to seeing you all again soon!